There are various online sources to stream music. Sometimes. sticking to one source for all your music needs doesn’t seem enough. Depending on a user’s need, he/she might use or prefer multiple music sources. For example, if you need music from various publishers then Spotify, Apple Music, Amazon Music are nice options. But if you need local music or remix, then SoundCloud, Reddit, MixCloud are the options to go with. Having so many different sources are not so easy to use and organize and that’s where multi-on-one music players come into play. This article covers 5 multi-in-one music players that let you fetch and play music from multiple sources. These music players have support for Spotify, Google Play Music, SoundCloud, MixCloud, Reddit, and many other sources. These music players help you bring all your favorite music at one place. Let’s check them out one by one in details. Manageyum is a versatile software that brings various cloud-based services to your desktop. This software is available for Windows, macOS, and Linux. Although this software is mainly for productivity, you can add any music source that has a web player. This software has plugins for all the supported service along with a custom option that lets you add a service manually. With this option, you can add a source by mentioning its URL and assigning a name to it. This way, you can bring music from Spotify, SoundCloud, Google Play Music, Amazon Music, and any other music service that supports web playback. The next multi-in-one music player on this list is Cloud Player. 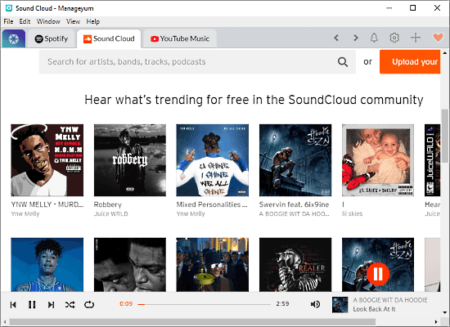 Unlike Manageyum, this music player has built-in support for SoundCloud and MixCloud. It has a universal search tool where you can search for music and then browse the results separately from multiple sources sorted in different tabs. You can also like a song to add them to your favorite list. Moreover, you can log into all the supported services to bring all your existing collections to Cloud Player. This player is available for Windows and macOS. You can download Cloud Player from here. UpNext is a Google Chrome extension that brings the music from SoundCloud to the address bar of your browser. 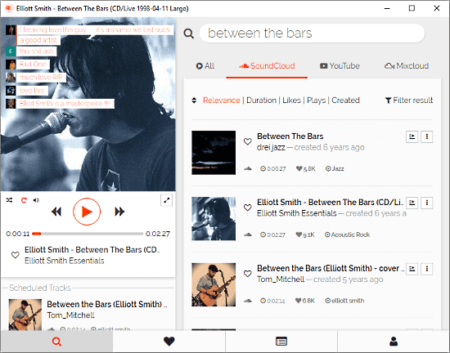 It is a web player where you can search for music from SoundCloud and one more online source. The results of both these sources are sorted separately. Each result shows you information about the track along with options to add it to your favorite list. Apart from the music search, this player also has playlists and charts where you can discover new music easily. This extension will also work with Chromium-based browsers which support Chrome extensions e.g. Opera, Brave, etc. Get UpNext for Google Chrome from here. Search: Search for music on Reddit. Radio: Shows popular music subreddits along with a list of other subreddits for specific genres. Collections: Fetches music collections from various subreddits along with trending and charts. Likes: Lists all the tracks you liked while using Headset. Unlike many other music sources, music collections on Reddit are curated by humans instead of algorithms. So, it’s a nice platform to find new music. 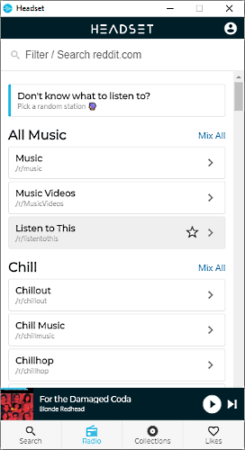 You can download this Reddit music player from here. 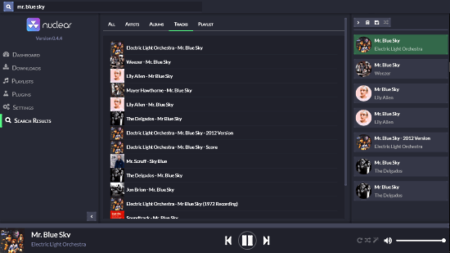 Nuclear is a free music player for macOS, Windows, and Linux. This player has built-in support for SoundCloud, Jamendo, Bandcamp and a few other online sources via plugins. In order to fetch the music from an online source, first, you have to select that plugin from the settings. After that, you can use the search option to find the music on that platform. In case of some particular platform, this player also lets you download the tracks for listening offline. You can bring music from multiple sources together by adding them to your collection, playlist, or downloaded list. Download Nuclear music player from here. If you are okay with a paid software then Harmony is an all-in-one music player that is available for Windows, macOS, and Linux. This software supports Spotify, Google Play Music, Sound Cloud, Huye Machine, Reddit, Deezer and more along with local music files. These are the 5 free music players that support multiple sources. 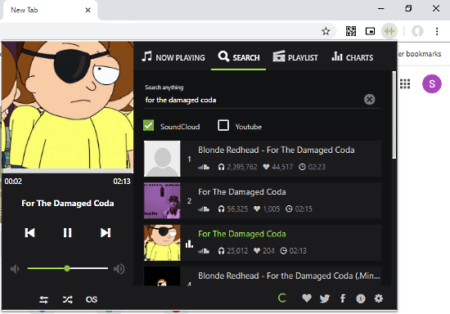 Instead of messing around with various tabs in the browser or using multiple desktop clients, you can use these players and have all your favorite music at one place.